We are an Authorised Ashford Dealer in New Zealand, and can supply any equipment from the current Ashford catalog for sale in New Zealand. This includes a wide range of spinning wheels, looms, carding and felting equipment, including spare parts, accessories and books. Please contact us by phone or email to order. International customers please contact the Ashford Agent in your region, or Ashford Handicrafts Ltd directly. Ashford manufactures a wide range of Spinning wheels, from traditional single treadle and castle wheels to modern double treadle versions, fold up wheels for easy transport and an electric spinner. They also make beautiful weaving looms in a range of widths, including traditional rigid heddle looms, innovative folding looms, 2 to 16 shaft looms, and tapestry looms. Then there is the carding equipment, including flick and hand carders, drum carders, and the inspiring blending board. Other Ashord equipment includes a felting board for wet felting, and felting needles and punches for needle felting. Diagonal weaving is an unusual and intriguing way to weave squares, rectangles and triangles with selvedges on all four sides, resulting in less work when joining and finishing. These fabric pieces can be used for mats and scarves, or joined to make other items such as hats, bags, cushions, rugs and blankets. 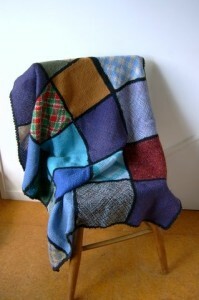 They can also be effectively combined with knitting and crochet to make jackets and other garments. There are more ideas and projects on the Blog page. While Fleecewood cannot claim to have invented this style of weaving, we have experimented extensively with developing the technique, and produce a range of boards (sometimes referred to as looms) for sale. Smaller boards are very portable and offer the opportunity to weave while travelling or convalescing in bed. These boards can also be used for more conventional styles of hand weaving. Diagonal weaving is an ideal way to use up left over yarns including short yarn lengths (40 cm or longer). Fleecewood Diagonal Weaving Boards are designed for 12-ply yarns, but with some minor adjustments yarns of almost any thickness can be woven effectively. Two or more thinner yarns can be woven together to produce 10-12 ply equivalent, or, if woven as a single, thinner yarns produce an open, lacy texture. Chunky and highly textured yarns can be included as accents, but need to be woven on every other pin if being used as the main weaving yarn. Fleecewood Diagonal Weaving Boards come in 100 mm, 200 mm, 300 mm and 400 mm standard sizes. These boards are square and the dimension indicates the length of one edge of the weaving area. The actual size of the finished weaving is likely to be less than this, depending on the yarn used, the tension applied during the weaving, and shrinkage due to fulling (washing of the finished weaving). The external dimensions of the board are the weaving size plus approximately 50 mm in each direction. In addition to the board, you will need a crochet hook appropriate for the yarn being woven. Boards come with written instructions. Check out the blog page for more ideas and information. FeltingFelting is the tangling of fibres to make a coherent fibre mass in either two or three dimensions. Techniques for achieving this are either the ancient craft of wet felting or the relatively new technique of needle felting. Each process has its strengths and weaknesses. Drawing on both techniques gives handcrafters a wealth of felting possibilities, because the strengths of one technique largely offset the weaknesses of the other. Wet felting is one of the oldest fibre crafts. Today, we use heat (from hot water) to open up the scales on the outside of the wool fibres, a lubricant such as soap or detergent in the water to facilitate the slippage of fibres, and lots of mechanical manipulation to encourage fibres to move and tangle. Wet felting only works effectively with animal fibres that have an outer layer of scales, such as wool, alpaca and mohair. Different fibres give different characteristics to the finished felt. Merino typically felts easily, producing a dense durable felt. It is also used to make specialty felts such as nuno, and to bind fibres that don’t wet felt so well, such as coarser wools or silk. Coarser fibres, such as the Leicester wools require more work to felt together, but produce a relatively open felt that draps well. Medium wools, such as Corriedale, produce a felt with characteristics between Merino and the coarser wools. Very little specialised equipment is needed for wet felting. Plastic bubble wrap, bamboo blinds and wheeled massage devices are good for speeding up the felting process. Ashford’s has a ribbed felting board , similar to the old wash boards, that works well. Needle Felting (also called Dry Felting) is a relatively new handcraft technique. It uses needles originally designed for industrial use, that are so effective at tangling fibres that there is no need for heat or lubricants. Different needle types optimise the felting effect in different fibre types, and at different stages of a project. WIZPICK offers a range of 16 different felting needles that cover a wide range of handcraft situations, from fast initial securing of fibres, to three dimensional shaping, developing and adding surface texture, joining felt pieces, surface hardening and finishing, and rooting doll hair. The internationally recognised WIZPICK colour coding system makes selecting the right needle easy. Needle Punches are a handle into which needles can be inserted. 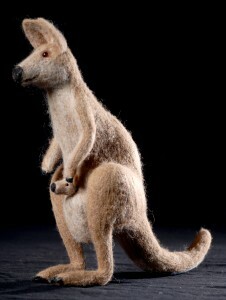 They enable people that have difficulty holding an individual needle to needle felt. They also allow several needles to be used together to speed up the needle felting process. The Fleecewood Multi-felter needle punch, made by a local wood turner, offers several different needle arrangement options and is designed for the more serious needle felter, whereas the Ashford needle punches are designed for people wanting a more basic and less expensive punch. There are many ways to make a floor rug. At Fleecewood we love to make floor rugs directly from prepared fleece, without spinning the fibres first. One way we do this is to latch hook fleece locks onto rug canvas, using the fleece lock in the same was as a short length of cut yarn. We also use our long staple English Leicester slivers to make looped pile rugs using a modified locker hooking technique.